Hi. My name is Louis. I am a budding machine learning researcher and PhD candidate at the University of Sydney working with Edwin Bonilla and Fabio Ramos. My main research interests lie at the intersection of Bayesian statistics, deep learning and implicit probabilistic models. This summer I am visiting Cédric Archambeau at Amazon Berlin for a research internship. Until 2017, I was a software engineer at NICTA (now incorporated under CSIRO as Data61) in the inference systems group, working on scalable Bayesian machine learning. I now work at Data61 on a part-time basis when I am not teaching. Previously, I studied computer science at the University of New South Wales, where I had a major emphasis on algorithm design and analysis, theoretical computer science, programming language theory, artificial intelligence, machine learning, and a minor emphasis on mathematics and statistics. I undertook my final-year thesis under Aleksandar Ignjatovic, and graduated with first-class honours in 2015. Probabilistic matrix factorization is a latent feature model that is used for link prediction and collaborative filtering. This post demonstrates how to approximate the KL divergence (in fact, any f-divergence) between implicit distributions, using density ratio estimation by probabilistic classification. We illustrate how to build complicated probability distributions in a modular fashion using the Bijector API from TensorFlow Probability. 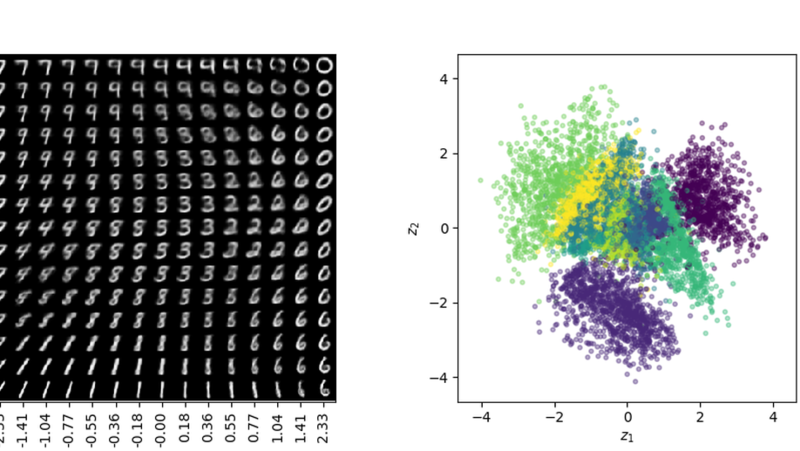 An in-depth practical guide to variational encoders from a probabilistic perspective. A mobile visual clothing search system is presented whereby a smart phone user can either choose a social networking image or capture a new photo of a person wearing clothing of interest and search for similar clothing in a large cloud-based ecommerce database. The phone’s GPS location is used to re-rank results by retail store location, to inform the user of local stores where similar clothing items can be tried on. Expanding the scope and applicability of variational inference to encompass implicit probabilistic models. Aboleth is a minimalistic TensorFlow framework for scalable Bayesian deep learning and Gaussian process approximation. Determinant is a software service that makes predictions from sparse data, and learns what data it needs to optimise its performance. Revrand is a full-featured Python library for Bayesian generalized linear models, with random basis kernels for large-scale Gaussian process approximations. The course has a primary focus on probabilistic machine learning methods, covering the topics of exact and approximate inference in directed and undirected probabilistic graphical models - continuous latent variable models, structured prediction models, and non-parametric models based on Gaussian processes. 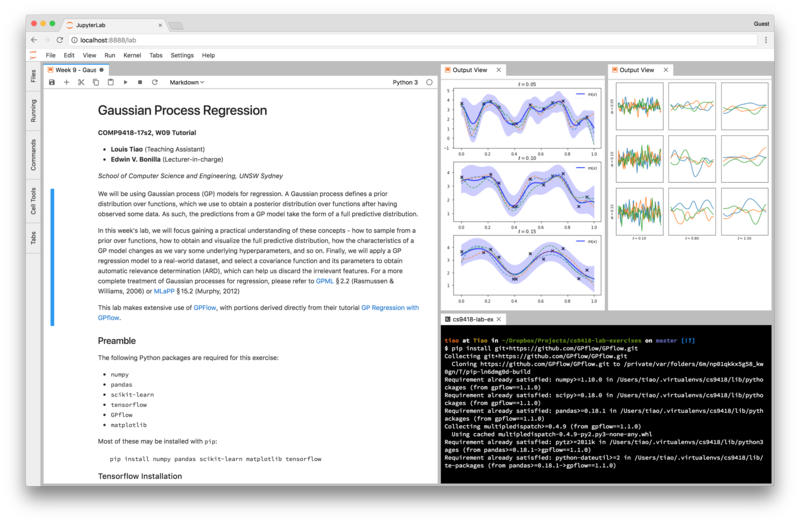 Lab exercise on Gaussian Process Regression, running in JupyterLab. This course has a major emphasis on maintaining a good balance between theory and practice. As the teaching assistant (TA) for this course, my primary responsibility was to create lab exercises that aid students in gaining hands-on experience with these methods, specifically applying them to real-world data using the most current tools and libraries. The labs were Python-based, and relied heavily on the Python scientific computing and data analysis stack (NumPy, SciPy, Matplotlib, Seaborn, Pandas, IPython/Jupyter notebooks), and the popular machine learning libraries scikit-learn and TensorFlow. Students were given the chance to experiment with a broad range of methods on various problems, such as Markov chain Monte Carlo (MCMC) for Bayesian logistic regression, probabilistic PCA (PPCA), factor analysis (FA) and independent component analysis (ICA) for dimensionality reduction, hidden Markov models (HMMs) for speech recognition, conditional random fields (CRFs) for named-entity recognition, and Gaussian processes (GPs) for regression and classification.